In the following pages I have endeavoured to give, in a series of picturesque sketches, a general view of the natural history as well as of the physical appearance of North and South America. I have first described the features of the country; then its vegetation; and next the wild men and the brute creatures which inhabit it. However, I have not been bound by any strict rule in that respect, as my object has been to produce a work calculated to interest the family circle rather than one of scientific pretensions. I have endeavoured to impart, in an attractive manner, information about its physical geography, mineral riches, vegetable productions, and the appearance and customs of the human beings inhabiting it. But the chief portion of the work is devoted to accounts of the brute creation, from the huge stag and buffalo to the minute humming-bird and persevering termites,—introduced not in a formal way, but as they appear to the naturalist explorer, or to the traveller in search of adventures! 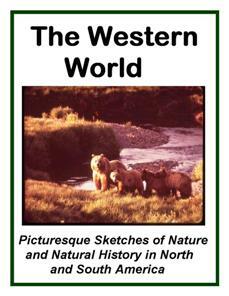 This interesting and educational PDF ebook is just $1.00!